Angela Loveridge has had a varied career, teaching English as a foreign language, working in radio, as a counsellor, and with people with mental health issues. It was her work with people with mental health issues that led her to set up an origami group; she now collaborates with business partners Zulay Newell and Dr Lizzie Burns. Origami pulse is working alongside manufacturer Re-wrapped, which has created a wrapping paper weighing in at 80gsm (a better weight for origami) rather than its standard 300gsm. Its paper is made solely from 100% recycled materials, using vegetable inks and environmentally-friendly products. One of the key parts of Origami Pulse’s plan is to develop its own paper, printed with crystalline chemicals that represent the happiness chemicals in the body, such as dopamine, and to represent these through happiness ‘symbols’ – so people will literally be folding happiness. 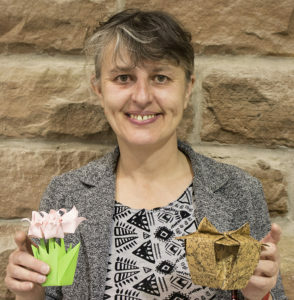 Angela’s recent teaching experience at the Open Door centre has led to an interest in how people see origami and assume that they can’t do it, before finding that they can, and the benefits this sense of achievement can have. The experience can be ‘life changing’ she says. 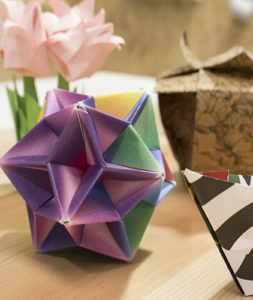 ‘I want to take a role in origami becoming recognised as a feel better tool –particularly in relation to mental health, and to publish a book on how origami changes lives, with statistics,’ says Angela. ‘We are generating statistics as we go along, so hope to collaborate and write this book, combining information about the creation of new neural pathways as a result of ‘making’ with the production and uses of origami. I also hope to travel the world teaching origami, and to to initiate a global mobile origami community through our website. ‘The main challenges are to finance publicity, finding the time to develop the enterprise and funding the development period,’ she says. A parallel interest lies in the greetings card industry. ‘In the UK, it’s responsible for employing more than 100,000 people, so – even though paper may be considered a dated material – it’s an area that is still massive,’ she says. ‘No other country has such a long and widespread tradition of sending cards. An average of 33 cards are send by each person per year and card making is the number one hobby in Britain. There are not existing physical cards in production for people specifically with mental health issues. One in six people have experienced a common mental health problem in the past week. Between four and ten percent of people will experience serious depression in their lifetime. Alongside workshops and a presence in hospitals, Origami Pulse is developing a website to build up the interactive element of their enterprise, enabling people to become part of a network, and be able to contact others through the site. ‘I think OpenMakers values are great. We’ve met so many people – it’s amazing how connections create a sense of wellbeing. The open-ness of ideas is fantastic. Just this little bit of involvement has made me believe my ideas can come to fruition,’ she says.